“This study evaluates the therapeutic potential of aPKC inhibition in retinal vascular permeability driven by inflammation and demonstrates that small molecule aPKC inhibitors have therapeutic potential for common ocular diseases,” commented Elizabeth A. Pearsall, PhD, Angiogenesis Laboratory of the Department of Ophthalmology at the Massachusetts Eye and Ear Hospital of Harvard Medical School, Boston, MA, USA. in an accompanying commentary. She noted that although there are still many unresolved questions about the etiology of inflammation, and whether it has a causative role in eye disease, additional pre-clinical studies necessary to bring small molecule aPKC inhibitors into clinical use are eagerly anticipated. The article is “Inhibition of Atypical Protein Kinase C Reduces Inflammation-Induced Retinal Vascular Permeability,” by Cheng-mao Lin, Paul M. Titchenell, Jason M. Keil, Adolfo Garcia-Ocaña, Mark T. Bolinger, Steven F. Abcouwer, and David A. Antonetti (https://doi.org/10.1016/j.ajpath.2018.06.020). The commentary is “Atypical Protein Kinase C: Breaking Down Barriers in Ocular Disease?” by Elizabeth A. Pearsall and Kip M. Connor (https://doi.org/10.1016/j.ajpath.2018.07.006). Both will appear in The American Journal of Pathology, volume 188, Issue 10 (October 2018) published by Elsevier. This study was funded in part by Supported by NIH grants R01 EY012021 (D.A.A. ), R01 EY023725 (D.A.A. ), and R24 EY024868 (D.A.A. and S.F.A. ), Research to Prevent Blindness grants (D.A.A. ), and JDRF grants (D.A.A.). 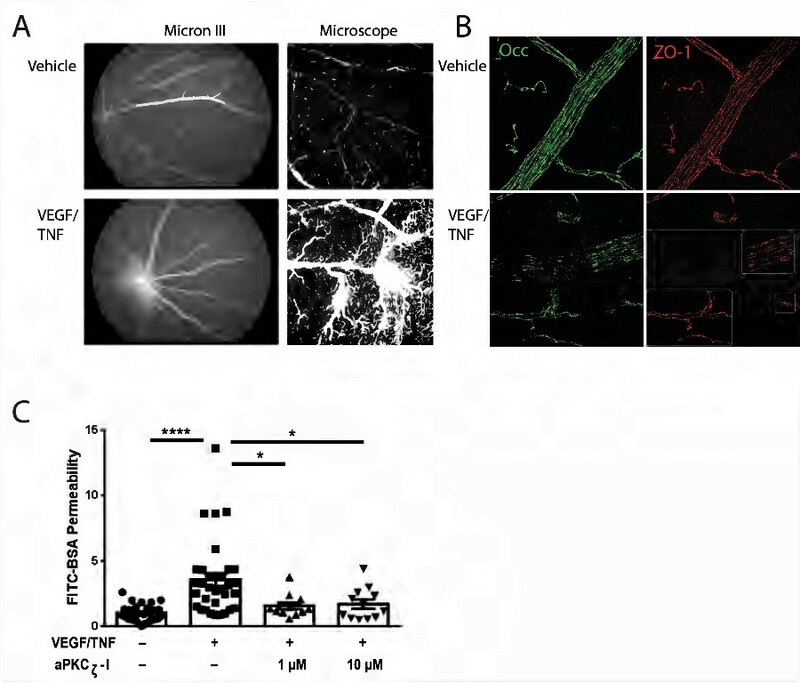 This work used the Vision Research Core at the Kellogg Eye Center, funded by National Eye Institute grant P30 EY007003 and Morphology and Image Analysis Core of the Michigan Diabetes Research and Training Center grant P30 DK020572. Full text of the study and editorial is available to credentialed journalists upon request; contact Eileen Leahy at +1 732 238 3628 or ajpmedia@elsevier.com. Journalists wishing to interview the authors should contact David A. Antonetti at dantonet@med.umich.edu. Elizabeth A. Pearsall may be reached for comment at Elizabeth_Moran@MEEI.HARVARD.EDU .